I landed here and instantly fell in love with this city. I ended up staying in a hostel called Backpacker B&B the staff were so friendly and helpful and the hostel was one of the best I have stayed in in Asia. I booked a four bed dormitory room and had a nice bunk bed (with a cute curtain) and a little table. The staff helped me book my next travel steps and were very friendly and helpful. I instantly felt at home here! Walking around the street of Yangon was my favourite part, it’s such an interesting city with Pagodas lining the city views, the Shewadagon Pagoda being the most famous but also the architecture is very interesting and there is still a lot of the old colonial style buildings. I felt an instant ‘buzz’ in Yangon, of excitement and hope, people would smile and chat to me. Also because tourism is still relatively new you don’t have the chasing or ripping off so much as you can sadly sometimes get in Thailand or other Asian countries. 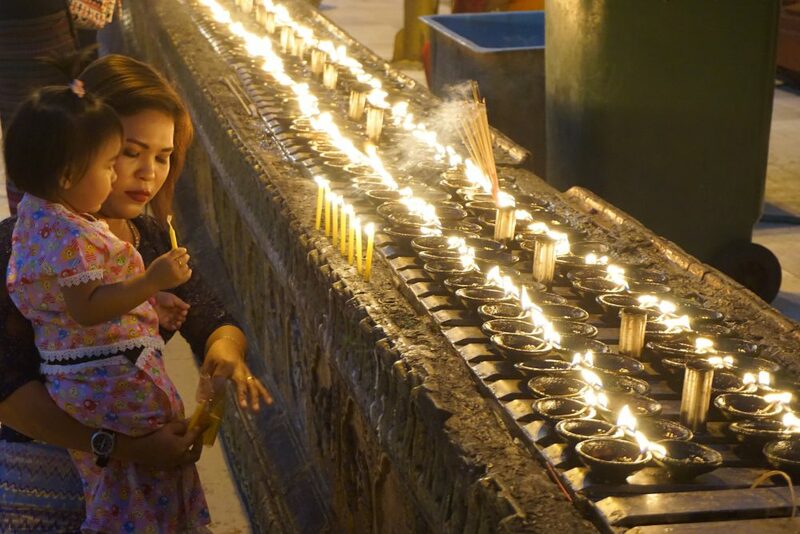 Woman and daughter lighting candles at the Shwedagon Pagoda in Yangon. My highlights in Yangon were visiting the Yangon Heritage Trust which is a really interesting organisation that is trying to ensure the protection of Yangons heritage and conserve a lot of the older buildings, whilst also trying to make it into a liveable and vibrant asian city. 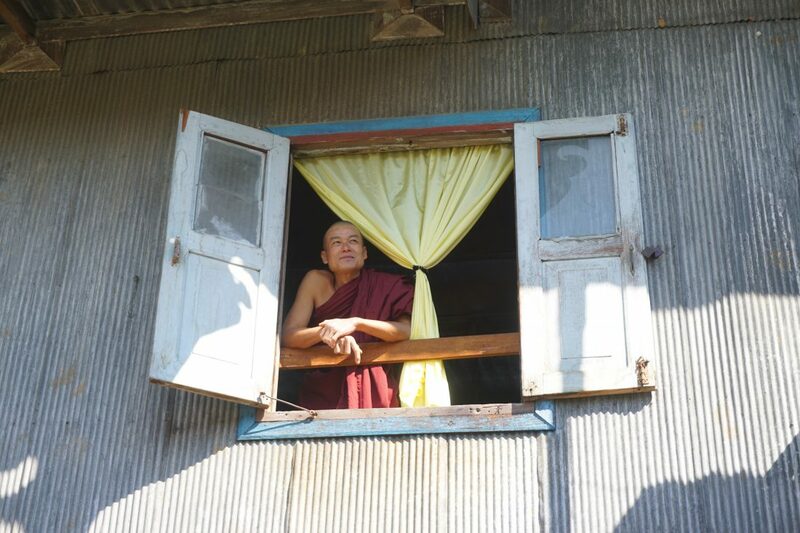 The trust has a photogprahy exhibition which chartered the history of Myanmar and Yangon. They also run daily walking tours around the city which sadly I didn’t do but heard were really good. Exhibition at the old Secretariat building in Yangon. Whilst in Yangon I also managed to visit a exhibition held in the old Secretariat building which used to be the centre of British Administration in colonial Burma. It is also where Aung San (the father of the Aung San Suu Kyi who recently lead the National Democratic League for Democracy party) was assassinated. He was Myanmars ‘Independence leader’ and is highly regarded politically. This building has been largely closed over the last few years by the Military junta, so for it to be open whilst I was there was very special. 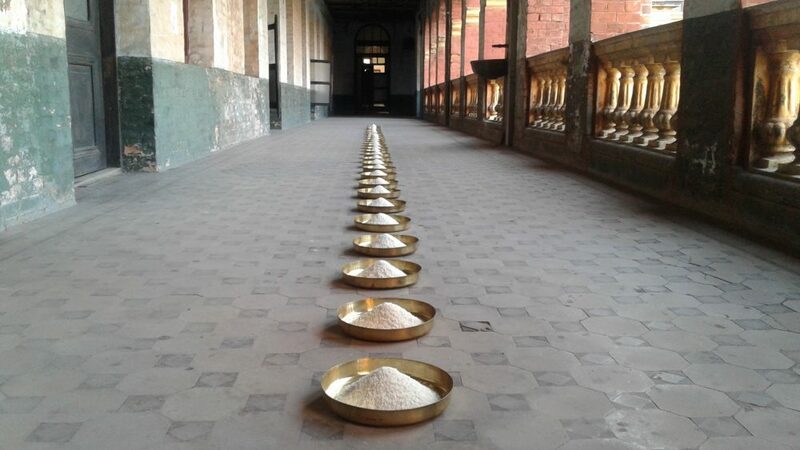 The exhibition was by internationally renowned artist Wolgang Laib Where the Land and Water Ends, and I felt very lucky to be able to visit and see it as it was only open for a short time. 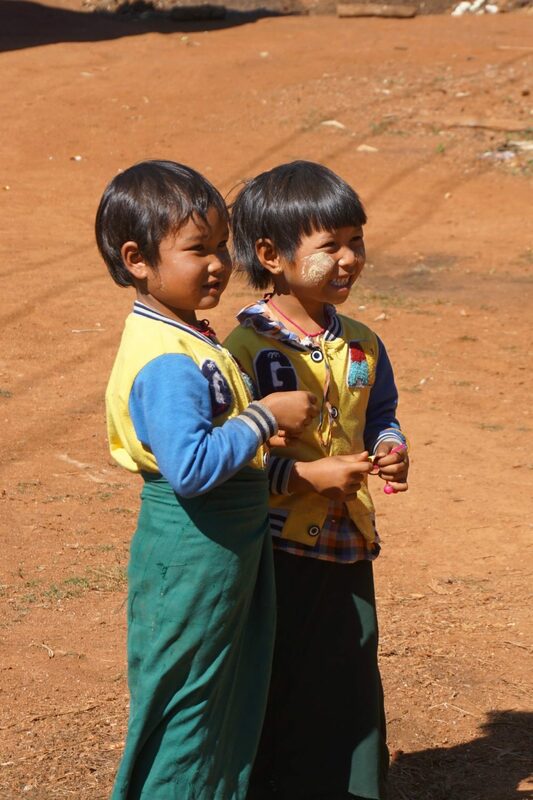 Children wearing the traditional Longyi skirts, Myanmar. 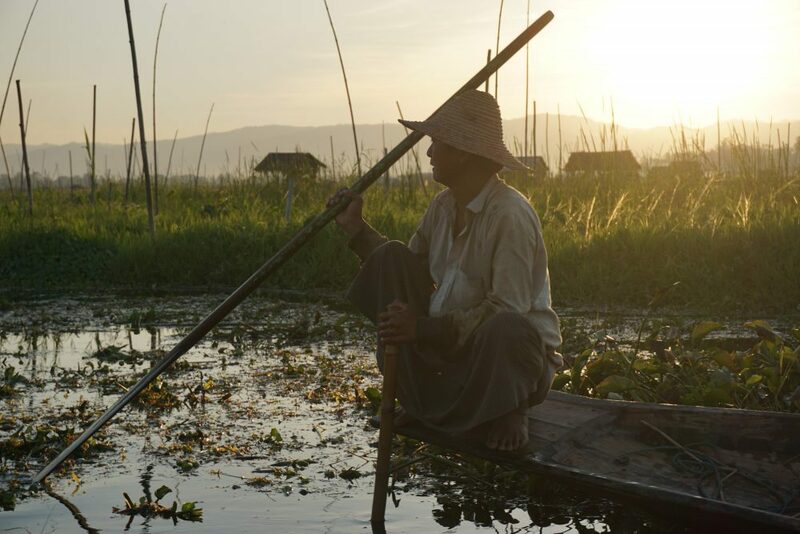 I also visited Inle Lake, which has to be one of Myanmars most beautiful destinations. It is 13km long and 7 miles wide and has fishing villages with houses mainly made of wood on wooden stilts, markets, buddhist temples and the famous Intha fisherman who fish on the lake itself. I trekked here from Kalaw (a beautiful small hill station in the Shan state of Burma) over 2 days and 1 night approximately walking 11-12 km a day. We stayed 1 night in a monastery and although it was a gentle hike, it was really beautiful to see the countryside, local farmers and villages over these two days. We visited schools and villages in the area and saw some of the old farming techniques that still exist such as horse and cart. It cost about USD35 which was really cheap I felt for this tour and our tour guide was lovely. Reaching Inle Lake was so spectacular, this place is a amazing! I spent 5 days here going out on boats, cycling round the lake and visiting various markets and temples at the different villages. Indein was my favourite village which you can reach by boat and has beautiful buddhist stupas and a beautiful market. I also really enjoyed the food and restaurants in Myanmar (some of the best I have had in south-east Asia). Pagodas at Indein village, Inle Lake. 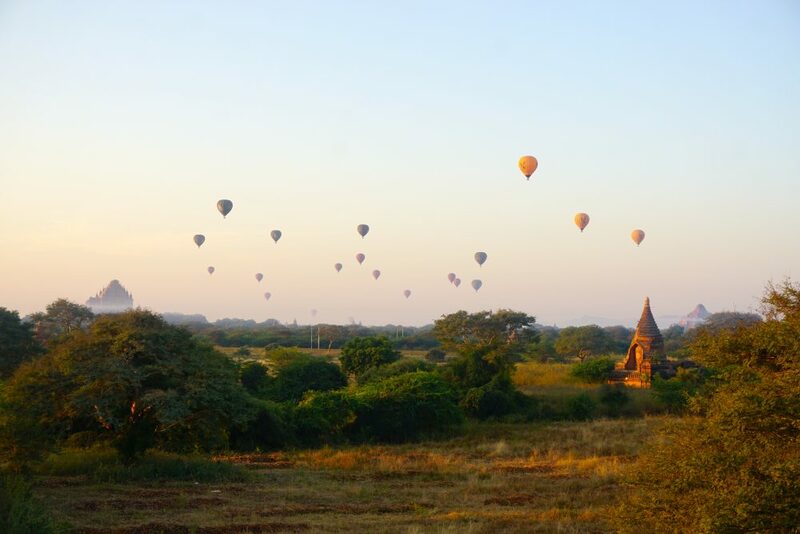 Sunrise and balloons over the pagodas at Bagan. My final highlight was visiting the magnificent Bagan an ancient city located in the Mandalay region of Myanmar. 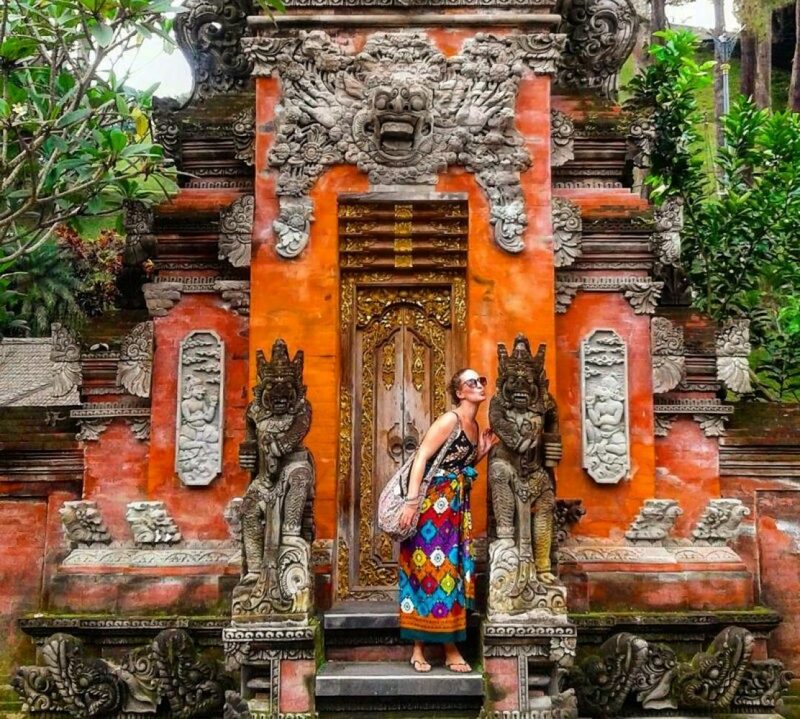 It holds over 2,200 temples and pagodas which have survived from the 11th and 13th century. Back in those days it was originally 10,000 Buddhist temples, pagodas and monasteries, but only around 2,000 have survived. Today it has become a huge tourist attraction and is compared widely to Angkor Wat in Cambodia. I spent another 5 days here mainly watching sunsets and sunrises from the various temples and pagodas, trying to find the ‘best’ and ‘most quiet’ one! It was so majestic here, you can cycle or get a motorised bike around the temples and spend days going around it. There are also villages to visit and me and some friends ended up meeting a lovely local Burmese artist who ended up taking us to his village to see a ‘hair cutting’ ceremony and to see his art work. 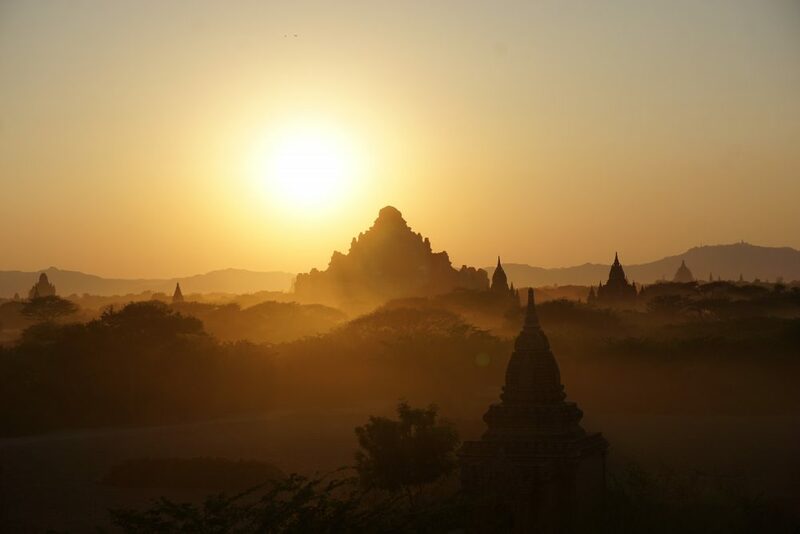 Beautiful Bagan temples at sunset, Myanmar. 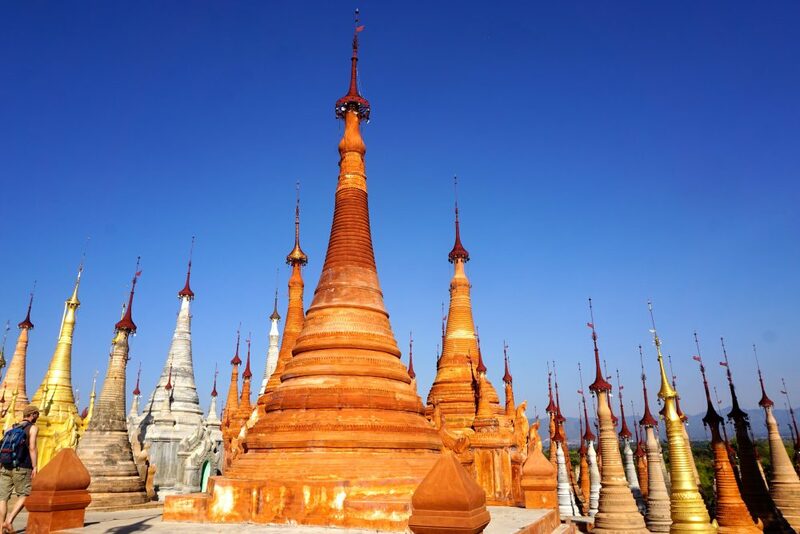 I totally fell is love with Myanmar and can’t wait to go back again hopefully soon!